One of the most popular and manipulated beer styles in the world of beer is the India Pale Ale. Within this over arching style there are numerous sub categories that have been experimented and developed to meet the ever increasing need to deliver more and more hops to the avid beer drinker in more and more interesting ways... The Red India Ale is one of those sub categories. As with most Red Ales its brewed strong with an enormous addition of characterful hops. 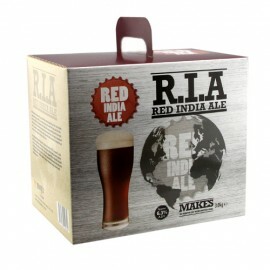 However, there is also a judicious application of caramel malts to create a maltier and darker coloured beer that helps the hops to become characterful in a slightly different way.Our Red India Ale pours a deep Red with a creamy head, your nose is immediately assaulted with a light pine sap and a tropical fruit punch aroma. On the palate the beer is a pleasing cacophony on textured caramel malts, firm bitterness and juicy hop goodness. The beer finishes smooth and dry with a lasting, cleansing bitterness. Makes 30 pints or 17 litres.